Pragmatic Hvac Engineers Pvt. Ltd.
Spot cooling is an effective solution for a wide range of cooling problems. These compact portable air conditioners can be used just about anywhere. 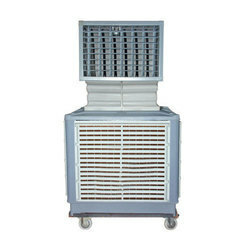 We are engaged in manufacturing & supplying a wide range of Spot Cooling Machine. These are highly appreciated by our clients because of having features like low cost, reliable, maintenance-free solution to a variety of industrial spot cooling problems. Pioneer Pollution Control and Air Systems Pvt. Ltd. Cold Air to -34C from your compressed air supply for spot cooling needs! We are recognized as a trusted Manufacturer, Exporter & Supplier of Spot Cooler. DRI Spot Coolers are reckoned worldwide for providing effective cooling within larger & much heated areas when compared to general cooling by means of a remote cooler fixed at one place. We offer the Spot Cooler to the clients at the market leading price. We are leading manufacturers and exporters of Spot Cooler in India. Our clients have highly appreciated these coolers owing to their optimum cooling, power efficiency and for being low maintenance. These are offered at competitive rates to our clients.